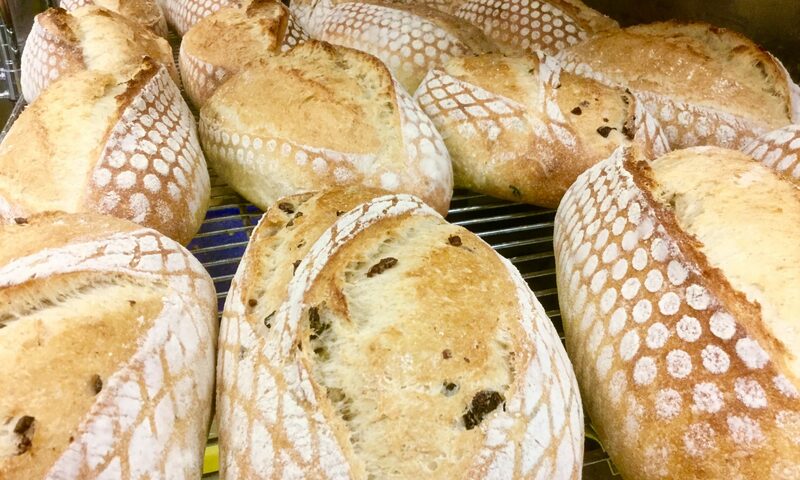 The preamble to the sourdough section of Reinhart’s BBA goes into details about building your sourdough culture, having you build up several cups worth of what he calls “barm”. Now if you were just getting to this part now, you wouldn’t really be able to make the breads for about two weeks since it takes at least that long to get a good starter going. Fortunately, of course, I already have an active starter and if you follow this blog at all, you’ll even have seen it’s development back in Aug ’09. You may even have started up your own as well and have a nice, well developed bubbly mixture ready to go. 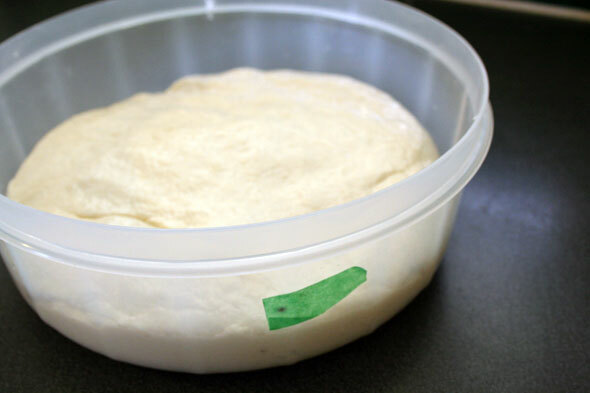 Since we already have our starter active and lively, I’ll skip the process as described in the book, adding only that I don’t feel Mr Reinhart’s method is the easiest nor that the quantity he asks the reader to make is sensible for an occasional baker. So I’ll point you to the August post linked above and recommend you follow that route instead and keep your “mother” starter to about a half cup in volume or less. This recipe is a multi-day affair, taking about 2 to 3 days if you follow the instructions. Day one is spent building a “firm starter” (which actually takes about 10 minutes) and then letting it chill in the fridge until the next day. Day two takes the stiff starter out of the fridge, allows an hour or two to un-chill, then building the dough, at the end popping it back in the fridge to rest, possibly overnight. Day three would be baking day. I built the “firm starter” (some Mother starter, flour and water for a 62% hydration mix) and let it develop until better than doubled then put it in the fridge overnight. I didn’t take photos of these steps as it’s practically identical to other preferment steps which I’ve already posted in several other entries, so let’s pick up here. First, the Mis en Place. 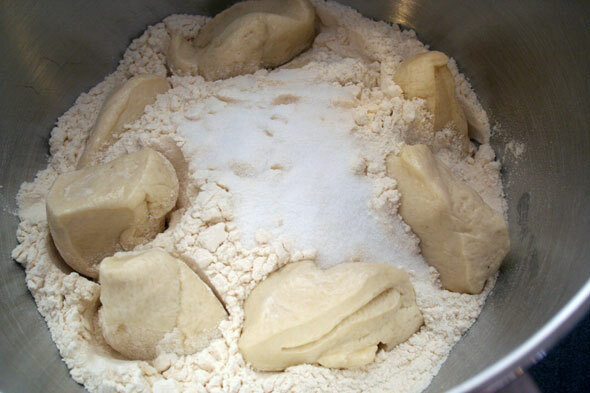 Here’s our ingredients for the “final dough”: water, bread flour, our developed 64% starter and 2 tsp salt. 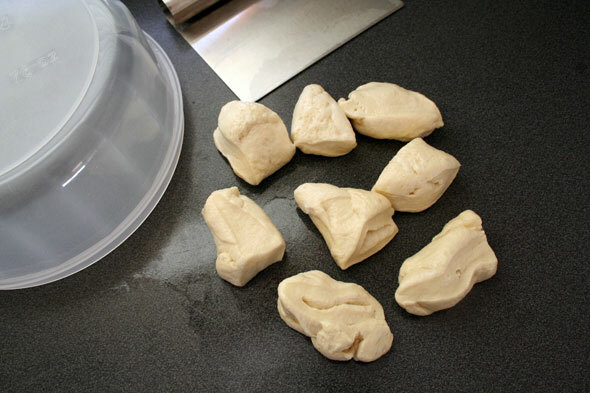 I coerced the dough out of the jar after it’s overnight stay in the fridge, then cut it into smaller pieces, covered with a bowl and allowed it to warm up for an hour or so. The warmed starter bits then got put into the mixing bowl along with the other ingredients and got a spin for a few minutes until well mixed. 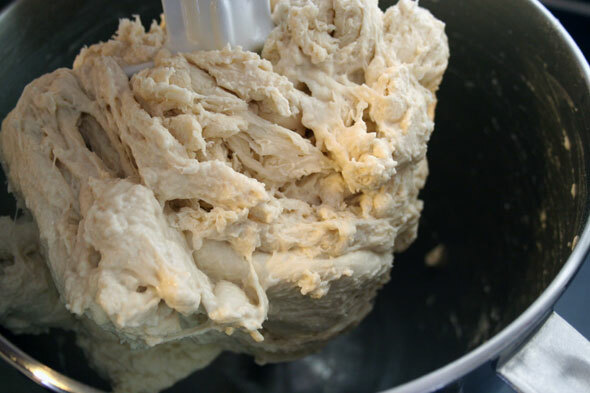 I switched to the dough hook and kneaded by machine for the required 4 minutes, gave the dough a 10 minute rest time (a bit of autolyse) then another 4 minutes kneading, all as per the recipe. Hand kneading would have taken about 12 to 15 minutes. This is then put in an oiled bowl, covered and allowed to bulk ferment for about 4 hours or until almost doubled. The dough is then formed into batards and allowed to proof in the couche for about 2 or 3 more hours. Reinhart suggests this can also be set in the fridge to proof overnight. 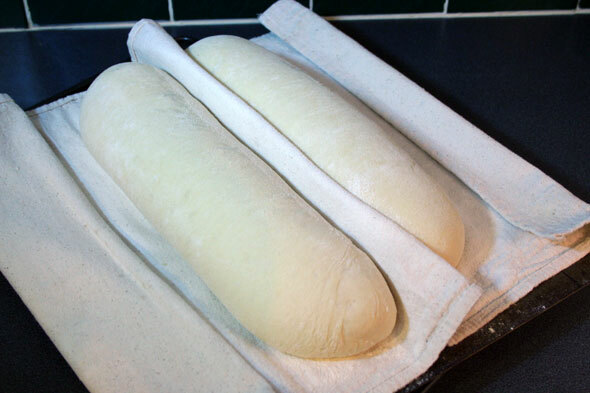 After final proofing, the loaves are transferred to a pan and slashed. They could also be placed on a peel then transferred and baked on an oven stone. Now here’s something new and different. Instead of “steaming” the oven with a pan of hot water and spraying the oven with a water bottle, I decided to give a go at this method. 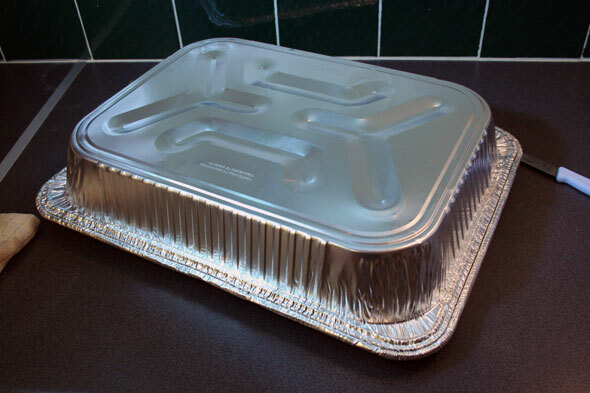 All it is is an inverted cheapie turkey roasting pan (just $2 at the grocery store – it was Christmas so there were lots of these things around) and it happens to fit the baking pans almost like it was custom made. So why use an aluminium pan? The idea here is that the moisture from the bread itself will do the “steaming” by being trapped inside the cover. 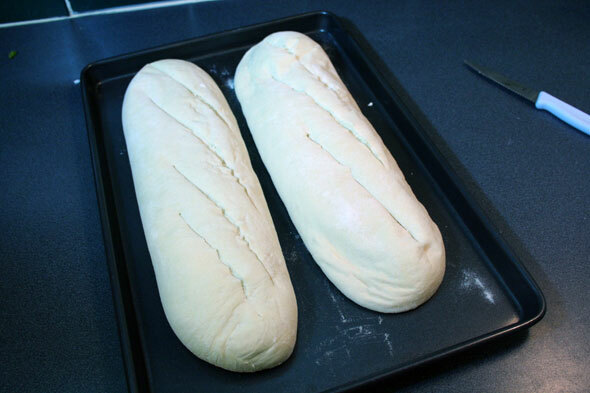 After about 10 minutes, the cover is removed and the loaf’s crust allowed to bake up normally. 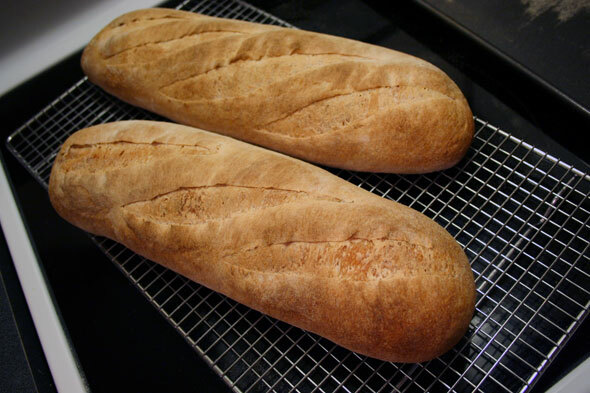 Like regular steaming and spraying, the moisture is expected to keep the crust supple during the first several minutes in the hot oven, allowing the bread to expand (oven spring) before the crust stiffens up. The main difference is simply that the space inside the cover is much smaller and the water from the dough itself is plenty to keep that small space humid. Steaming the entire oven, obviously, would require a lot more water/mist than the loaves themselves could supply. The same process is also achieved by using a “cloche” which is really just a clay version of the same thing or putting the dough in a large cast iron pot: they all trap the moisture from the dough inside a smaller space. This method is just a whole lot cheaper. The loaves went into a 450º oven (475º to heat then loaves put in and temp reduced to 450 which allows for a bit of heat loss while loading), allowed to ‘steam” in their make-shift “cloche” for 10 minutes, then the pan is removed. The loaves are also rotated to ensure even baking. They stay in the oven for another 10 – 20 minutes. I think these guys could have gone a bit longer than I let them stay, they’re looking a tad anaemic. Visually, these aren’t bad. As noted, a bit darker would have been good. The crumb, while not “tight” was still pretty even and small. I think a more open crumb would have been better. Perhaps my hydration was off. The crust under the pan was somewhat thin and a bit soft. I’d even say it was “papery” – it seemed to have developed a somewhat flaky aspect, like flaky pie crust. This isn’t ‘bad’ just a bit unexpected. And the flavour? This is where I’m afraid this loaf gets bad marks. I know for a fact that my sourdough can produce really nice sourdough flavour, I’ve done it numerous times making Hamelman’s Vermont Sourdough. But in this recipe, there was a distinct lack of flavour. Not flavourless but not very flavourful either. A darker, heartier crust would likely have helped but it was still overall… lackluster. On a score of 1 to 5 slices, I’m afraid this one wouldn’t get much more than 3. I was rather disappointed. Especially since this Sourdough section of the whole Challenge was seen as sort of the “holy grail” of the adventure. So definitely a let down for me. Which was another reason, besides other things happening around the holidays, that I went on a bit of hiatus from the Challenge. So after this, I made more of my “go to” recipes, like the Mike Avery sourdough bagels, biscotti and a batch of Hamelman rye. But I’m back into it and ready for the next BBA Challenge recipe: New York Deli Rye. I do hope that it makes up for the disappointment of this bread. Sally at Bewitching Kitchen had her own go at it and quite liked her results. Oggie from I Can Do That also gave hers a high mark (and cool shapes). Katya of Second Dinner suspects a sluggish starter may have caused the dense (but pretty) loaf. Your loaves sure look beautiful! Too bad you were disappointed with them. I didn’t quite care for them either, but I think it was because my new starter wasn’t quite ready for prime time. I’ve heard about using an inverted roasting pan as a “cloche”. I have a la cloche but these types of loaves don’t fit in it . I’ll have to try this method. Looks interesting. Thanks for the tutorial! GORGEOUS bread! Kudos… Now I’m really looking forward to baking this one. I have made this twice and enjoyed it. I am glad that you are back on track. 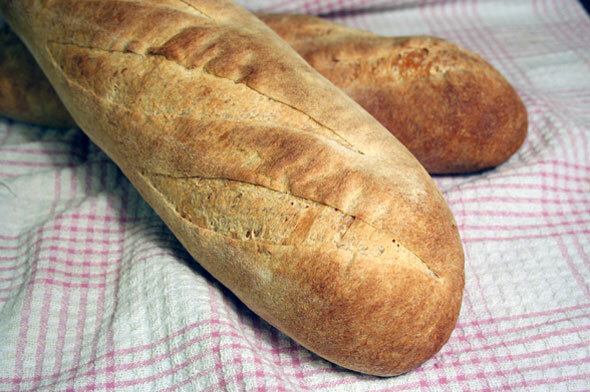 I have had mixed results with some of the breads and am looking forward to your blogs. I’m just about to start this bread, and I need a little hand-holding. I feel a little stupid asking, but . . . better to ask than to ruin my bread, right? I made my seed culture and starter (with your help!) and have been keeping my mason jar in the fridge, full of about 3 ounces of starter. Every week, I have been stirring and taking out an ounce, discarding the rest, and adding an ounce of flour plus an ounce of water. (I hope this is right so far!) Then I put it back into the fridge. I’m confused about how I turn this into the barm that Peter Reinhart wants us to use to create the firm starter for the basic sourdough (and other sourdough recipes). .-= Abby’s latest blog post: Pugliese (BBA #29) and the Best Idea Ever =-. Glad to hear your new pet is doing well! 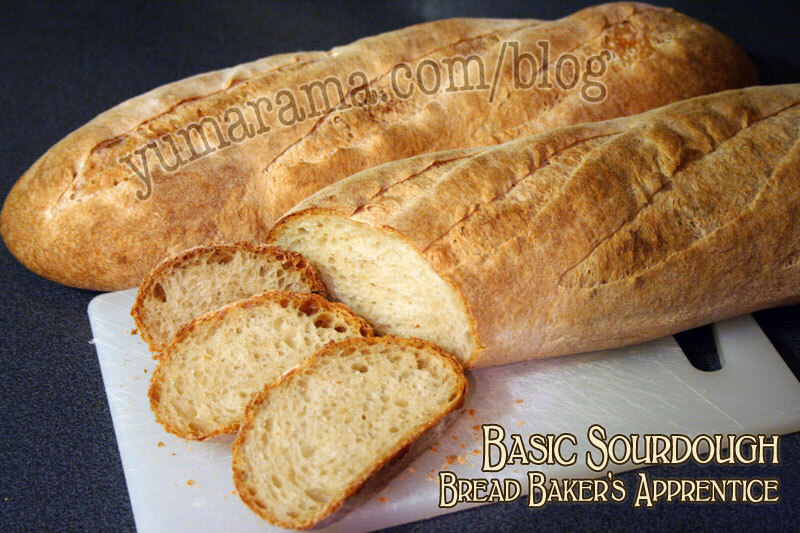 You don’t need to turn it into anything, your starter already is “barm”. Barm is simply Reinhart’s (incorrect) name for starter. So when you see the word “barm” just think “starter” instead. Now what you need to do is get yourself 4 oz. 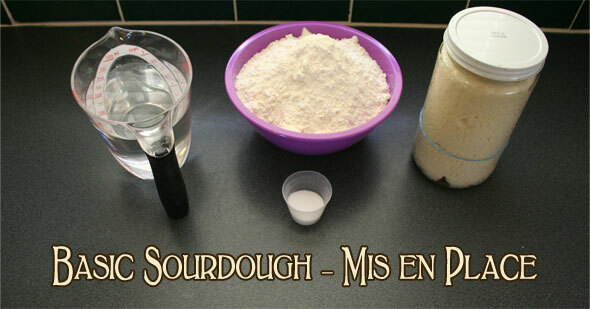 of starter for the Basic Sourdough recipe. If you’re keeping 3 oz but cutting back to 1 oz of old starter at each feed, then you’re removing 2 oz of excess. So take out that 2 oz of excess starter, put it in another jar and add 1 oz of water plus 1 oz of flour and let it expand out on the counter for a couple of hours until it’s just about peaking. You now have your 4 oz of starter for the recipe. With that other 1 oz, feed as usual, let it rise for a couple of hours on the counter until it’s increased to almost double then get Mom back into the fridge, safe and away from the baking stuff. I might also recommend you do 1 oz of old starter and 2 oz of water + 2 oz of flour which gives you a feed ratio of 1:2:2, this gives your starter more food. This will then give you a 5 oz Mother Starter and 4 oz of excess to make bread with at each feed. And if it happens that you aren’t baking that week, you’ll be discarding just 2 oz of flour, not a big deal.